Basal-cell and squamous-cell cancers are the most common skin cancers. Both are found mainly on parts of the body exposed to the sun, such as the head and neck. They are strongly related to sun exposure. They are much less likely than melanomas to spread to other parts of the body and become life threatening. Still, it’s important to find and treat them early. If left alone, they can grow larger and invade nearby tissues and organs, causing scarring, deformity or even loss of function in some body parts. 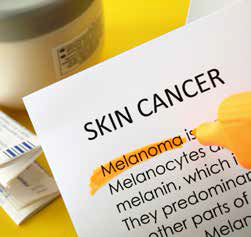 Melanomas are cancers that develop from melanocytes, the cells that make the brown pigment that gives skin color. Melanocytes can also form non-cancerous moles. Melanomas can occur anywhere on the body, but are more likely to start in certain areas. The trunk is the most common place in men. In women, the legs are the most common site. The neck and face are other common places. Melanomas are not as common as basal-cell and squamous-cell skin cancers, but they can be far more serious. Melanoma is almost always curable in its early stages. But if left alone, it is much more likely to spread to other parts of the body, where it can be very hard to treat. Getting regular skin checks is important so that any problems can be caught and treated early.